And yes, more on ArtFest soon. Thank you all for your kind comments and for reading that entire long post! 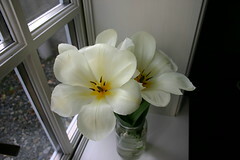 This is a picture of the tulips Jonny brought with him when he came to stay with me at the B&B in Port Townsend last weekend. They are from our yard. The tulips really know how to BLOOM this year. Incredible. We have jars of them all around our house now and they are all blooming like this. And every jar has one little wayward tulip (seriously, it is so much fun) trying to get a new view out the window or of the room it is in. Take a breath. Open up. And bloom. This is the phrase that keeps running across my mind. What would happen if we let ourselves bloom like these gorgeous tulips? What are you afraid of? What is stopping you?